Montag never questions the destruction and ruin his actions produce, returning each day to his bland life and wife, Mildred, who spends all day with her television ‘family’. But then he meets an eccentric young neighbor, Clarisse, who introduces him to a past where people did not live in fear and to a present where one sees the world through the ideas in books instead of the mindless chatter of television. When Mildred attempts suicide and Clarisse suddenly disappears, Montag begins to question everything he has ever known. I have had this book on my priority to read list for quite some time now but have been postponing reading it until I really felt like it. I got in a classics mode after finishing Ready Player One and thought this might be a good read next since it is coming out as a movie later this year. I tend to move books up on my to-read list when I learn that they are being converted to the screen. However, I am disappointed. Maybe disappointment is the wrong word. Perplexed perhaps as to why this became a classic is more accurate. I strongly like the idea of this dystopian future where books are illegal and firemen start fires instead of putting them out. But it was just too weird for me to understand why it got so big. One reason why I didn’t like it, might be because I am part of this problem Bradbury describes. And that is one scary thought! And nothing I can’t really help either. In Bradbury’s world it was decided that the free thought was what made everyone depressed and the world a bad place. By reading, everyone was more aware of the world and all the sadness and bad things in it. Why read about things that aren’t real? Why read about things that can lead to depression and suicide? Why read at all when you can surround yourself with screens as walls that contain your “happy family” who tells you how to be and live. How to be controlled. It really reminded me of 1984 by Orwell. This could have been the first stage to that extreme controlled big brother society. Anyway, where I come into this whole scary scenery is that I am controlled by what I read. I do read. I read a lot and I am proud of it. But I read as my leisure time. I don’t watch TV, I much more prefer to read and have the world grow in my head instead of just being an image projected there. I can read on the bus with tons of people around me, sure I have music in my ears, but I can read and understand what I am reading without really thinking about what the meaning of it all is. That is how books nowadays are written. And I guess that can kind of compare to the braindead people in Fahrenheit 451 where they do the easy thing where the least amount of brainpower is needed, something leisurely. Now when I wrote that theory down, it sounds stupid, I might not be the person who discards all books to watch the walls, but many others today sure are. The real problem with what I just wrote I think comes down to this: It is an old book. It is written in a different way from books are nowadays. I get the feeling that back then, it was as important how it was written as what the text was actually saying. And I just don’t see how that is an entertaining text where you don’t even understand the meaning behind the words. How am I supposed to get a world in my head when nothing makes any sense? When so many paradoxes are used to described the story, when there are more metaphors describing every action? Perhaps if you spent some time analyzing the text every other page or so you might understand and get the deep meanings behind every word. But like I said, I like to read leisurely, so this was clearly not for me. I might be the wrong person to write this review then? More things that bothered me, the dialogues. Extremely weird and didn’t make any sense at all. Like they randomly took thoughts from their heads while watching the big screens and throwing them at each other where they did not quite fitted. Was it because they were more real than any other dialogue in a book because all the characters usually always says the perfect thing? Last but not least, the ending. I got the feeling from it, but it was just so strange that I had to read it several times to make sure that I wasn’t hallucinating or something while reading it. Super weird. I have my idea of what a good book is. I know what types of books I like, and even if I feel like being a little cultivated every now and then with something from the row of books behind my favorites, I rarely get this disappointed. Yet, I don’t regret reading it But I did expect more. I have now made myself a personal opinion about another classic. Maybe next time I will go even further back in time and finally read something of Jules Verne? Fahrenheit 451 gets a 2 out of 5, it was a book which I didn’t enjoy very much, but I don’t really regret reading it either. 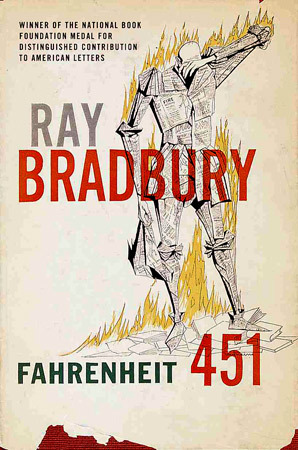 This entry was posted in Book Reviews and tagged Ballantine Books, classic, dystopian, Ray Bradbury, Science fiction by Alexandra. Bookmark the permalink.